The Buffalo Bills, reigning AFC Champions, were 11-2 and had clinched the AFC East title but needed a win to assure home field advantage in the playoffs as they faced the Los Angeles Raiders on December 8, 1991. Head Coach Marv Levy’s team excelled with a quick-striking, no-huddle offense developed by offensive coordinator Ted Marchibroda and directed by QB Jim Kelly (pictured above). Other key players on offense were highly-dependable WR Andre Reed and RB Thurman Thomas, an outstanding all-purpose back. Star DE Bruce Smith missed most of the season with a bad knee but the linebackers and backfield were strengths. The Raiders, coached by Art Shell, had won four straight games and were contending in the AFC West with a 9-4 record. As usual, the roster was loaded with veterans. QB Jay Schroeder was inconsistent but third-year WR Tim Brown was a rising talent. The defense benefited from the addition of 32-year-old SS Ronnie Lott. There was a big crowd of 85,081 at the cavernous LA Memorial Coliseum. The teams traded punts before the Raiders, starting at the Buffalo 32, drove to a score in seven plays. RB Marcus Allen ran the ball six times and Jeff Jaeger kicked a 19-yard field goal. The Bills reached midfield before having to punt and the Raiders started with possession at their seven yard line. However, they took just four plays to advance 93 yards. RB Roger Craig ran twice for 17 yards and, after a short pass to FB Steve Smith lost two yards, Jay Schroeder threw to Tim Brown, who charged down the right sideline for a 78-yard touchdown. Jaeger added the extra point and Los Angeles was ahead by 10-0. The ten-point margin didn’t last long, however, as WR Al Edwards took the ensuing kickoff all the way back for a 91-yard TD. Scott Norwood’s extra point made it a three-point game in short order. The Raiders had the ball as the contest moved into the second quarter and put together an 80-yard series in 13 plays. Schroeder completed a third-and-four pass to Allen for 21 yards and, after running plays moved the ball to the Buffalo 40, to TE Ethan Horton for a 17-yard gain on third-and-eight. A run by Allen on third-and-10 got the ball to the 14 and Schroeder kept the ball himself for a two-yard gain to convert fourth down. That set up a 12-yard touchdown carry by RB Nick Bell and, with Jaeger’s successful point after, the Raiders were up by 17-7. The teams again exchanged punts before the Bills, starting at their nine, drove into LA territory. After a roughing-the-passer penalty on first down, Jim Kelly completed four straight passes to start things off, gaining 32 yards to the LA 48. However, facing fourth-and-one shortly thereafter, FB Carwell Gardner was stopped short. As the half came down to the last two minutes, the Raiders punted and CB Clifford Hicks returned it 59 yards to the LA 33. Three plays later, Kelly threw to TE Keith McKeller for a nine-yard TD and Norwood added the PAT that made it a three-point game once again. But the first half scoring wasn’t yet over as the Raiders drove to the Buffalo 11 in the last minute. The big plays were Schroeder passes to WR Mervyn Fernandez for 16 yards and to Tim Brown for 28 yards. Jaeger kicked a 28-yard field goal and the Raiders were ahead by 20-14 at halftime. The Bills had first possession in the third quarter and were forced to punt. Los Angeles added to its lead with a nine-play, 75-yard scoring drive. The big play was a Schroeder pass to Fernandez that gained 59 yards to the Buffalo 13. An apparent Schroeder touchdown on a fourth down play was reversed upon review of the replay, but five plays later, and with the help of two penalties on the Bills, Allen ran for a TD from a yard out and Jaeger’s extra point made the score 27-14. Kelly went to the air often in the next series, but after reaching the LA 17 he was sacked by DE Greg Townsend for a nine-yard loss and a false start moved the Bills five yards farther back. Norwood’s 49-yard field goal attempt sailed wide to the right. The Raiders punted following their next possession and, in a drive that extended into the fourth quarter, the Bills again penetrated deep into Los Angeles territory. Kelly had completions to WR James Lofton for 19 and 16 yards and to Andre Reed (pictured at left) for 12 and 11 yards. But Buffalo once again came up empty when Norwood missed another field goal, this time hitting the right upright from 32 yards away. The teams traded turnovers when Schroeder fumbled and LB Darryl Talley recovered for the Bills at the LA 28, but two plays later Ronnie Lott intercepted a Kelly pass. The resulting short series for the Raiders that ended with a punt and this time Buffalo did not falter. With Kelly firing exclusively out of the shotgun, the Bills reached the LA three and, on his third attempt, RB Kenneth Davis reached the end zone from a yard out. The snake-bitten Norwood shanked the extra point try, however, and the score remained 27-20 in favor of the Raiders with just over four minutes remaining in regulation. Playing conservatively, the Raiders ran the ball three times and punted. The Bills took over at their 36 and went 64 yards in eight plays. Kelly started off with back-to-back 13-yard completions to Thurman Thomas but tossed three incomplete passes, with a 10-yard holding penalty interspersed, to face a third-and-20 situation from the LA 48. A pass to Thomas gained 19 yards and, on fourth-and-one, Kelly threw to Reed for a 20-yard gain. Two plays later, Kelly connected with Lofton for a nine-yard TD and, with Norwood coming through with the all-important extra point, the score was tied at 27-27. There was no further scoring in the last minute and the contest headed into overtime. The Raiders had the first possession in the extra period, but a long Schroeder pass was intercepted by FS Mark Kelso. Starting from their own 36, the Bills struck quickly as Kelly connected with Reed for a 31-yard gain to the LA 33. Thomas ran the ball three times and then Norwood came through with a 42-yard field goal to win the game for Buffalo at 2:34 into overtime by a score of 30-27. The Bills had the edge in total yards (409 to 386) and first downs (25 to 18). However, they were also penalized 10 times, to five flags thrown on the Raiders. While Scott Norwood’s three missed field goals and one extra point also were a handicap, the Bills benefited from 195 yards in combined kick returns, including a touchdown on a kickoff and a long punt return to set up another score. Los Angeles turned the ball over three times, to one suffered by Buffalo, and the offense faltered badly in the crucial fourth quarter. Jim Kelly completed 33 of 52 passes for 347 yards and two touchdowns with one interception. Thurman Thomas was held to 57 yards on 15 carries but also had 7 catches for 76 yards. 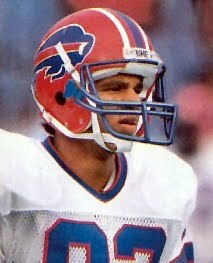 Keith McKeller caught 10 passes for 57 yards and a TD and Andre Reed gained 107 yards on his 8 pass receptions. For the Raiders, Jay Schroeder was successful on 11 of 21 throws for 252 yards and a TD with two intercepted. 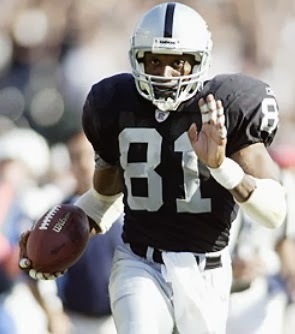 Tim Brown (pictured below) gained 106 yards on just two catches thanks to his one long scoring reception. Marcus Allen ran for 57 yards on 16 attempts that included a touchdown and also had three catches for 38 yards. Mervyn Fernandez contributed two receptions for 75 yards. The win assured that Buffalo would be top seed in the AFC for the postseason. Finishing with a 13-3 record, the Bills advanced to the Super Bowl for the second straight year, but lost to the Washington Redskins. The Raiders fell out of a tie for first in the AFC West with Denver and lost their remaining games to end up third in the AFC West at 9-7, but still secured a playoff spot. With rookie QB Todd Marinovich replacing Jay Schroeder, they lost in the Wild Card round to the Chiefs. 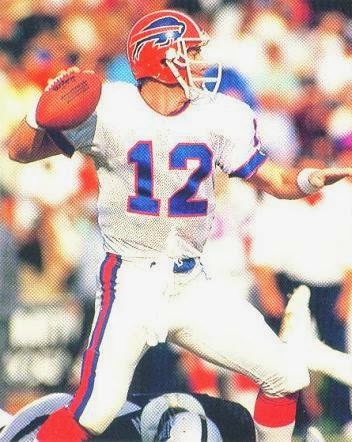 Jim Kelly led the league in TD passes with 33 and the AFC in overall passing with a 97.6 rating. He received consensus first-team All-NFL honors and was chosen to the Pro Bowl for the fourth time. Thurman Thomas topped the NFL with 2038 all-purpose yards and was the AFC rushing leader with 1407 yards. He was the consensus league MVP. Andre Reed was chosen to the Pro Bowl for the fourth straight year after catching 81 passes for 1113 yards and a career-high 10 touchdowns. Scott Norwood’s placekicking inconsistency was indicative of a season in which he was successful on 18 of 29 field goal attempts, but only 10 of 20 from 30 yards or more. He had missed a potential game-winning field goal try from 47 yards at the conclusion of the previous year’s Super Bowl against the Giants, and it all set the stage for his departure from the Bills after seven years.